A top quality variety with superb winter hardiness, providing reliable and great tasting crops throughout the winter months. The long white shanks are topped with blue green foliage and can remain in the ground ready to be harvested over a long season. Sow indoors January to March. Sow thinly 1.5cm deep into trays of compost. Water well and place in a warm, light position, away from cold draughts and out of intense, direct sunlight. Keep the compost just moist and be careful not to overwater, the compost should almost dry out before it is watered again. Seedlings should start to appear in approximately 14-28 days. Carefully transplant the seedlings to other trays when they are large enough to handle, spacing them 5cm apart and keep moist. In late May or early June, acclimatise plants to outside conditions, avoiding any late frosts. Place pots outside in a sheltered spot during the day and bring them inside again at night when the temperature falls. Do this for a week or two, until the plants have hardened off. Then transplant to a sunny growing position. Make 10cm deep holes in the soil with a dibber, spaced 15cm apart, in rows 30cm apart. Place seedlings in the hole and just water them in. This will bring soil down around the roots without compacting it and restricting the future growth of the stems. Keep the soil moist and remove any weeds as they appear. Sow outdoors April to May. Leeks can be sown directly outdoors, although plants may take a bit longer to get going and therefore be ready to harvest slightly later. Choose a sunny location for best results. Sow directly into a seed bed 1.5cm deep, in shallow trenches 20cm apart. Cover the seeds with fine soil and water well. Keep the soil moist and remove any weeds as they appear. When large enough to handle thin the seedlings out to 5cm apart. When stems have grown to the thickness of a pencil, transplant them to their final growing position. Make 10cm deep holes in the soil with a dibber, spaced 15cm apart, in rows 30cm apart. Place seedlings in the hole and just water them in. This will bring soil down around the roots without compacting it and restricting the future growth of the stems. Keep the soil moist and remove any weeds as they appear. Once the seed packet has been opened, the seeds can be stored in an airtight container until required for further sowings. Leek seeds will maintain their vigour for a good number of years. Leeks are not recommended for growing in patio containers although baby leeks can certainly be grown in raised beds or troughs. Plant growth can be set back if weeds are allowed to develop, keeping on top of the weeding is especially important in the early stages. Leeks can sometimes be affected by rust in wet summers but this usually just affects the leave and rarely causes serious losses. 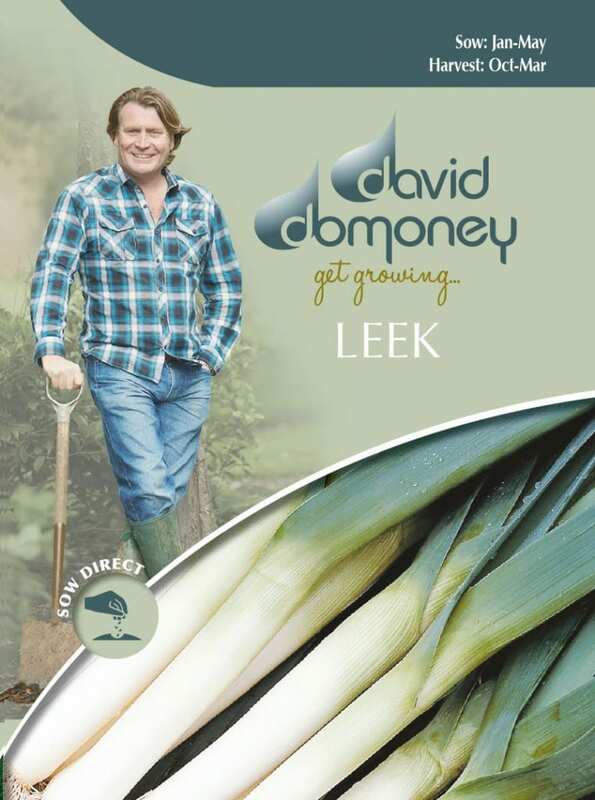 Harvest the leeks as they are required, from October through to March. Plants can be harvested at any stage. When thinning out the young plants, those that are removed can be used for salads and stir fries as they have a really good flavour. Drawing soil up around the plants as they develop will improve the length of the white blanch, keeping the stems tender and in the best possible condition.